Six pack abs: how you can get them. Questions and answers on six pack abs, hamstrings, and cardio. I’ve been bodybuilding for many years, doing crunches at two workouts every week, but still my abs don’t look great. I want ripped six pack abs. What am I doing wrong? If you’ve been doing crunches correctly, and have built up to using a decent poundage, you should have developed your rectus abdominis substantially. The rectus abdominis is the six pack abs muscle. But whether you can see yours depends on how much fat there is around your midsection. The guys with ripped six-packs have well-developed abs and next to no fat covering them. It’s that combination which gives them outstanding six pack abs. There are muscles of the frontal abdominal wall other than the rectus abdominis, but it’s the latter that gets most attention. Those other muscles are the external oblique, internal oblique, and transversus abdominis. Of those three, only the external oblique is visible provided the body is lean enough. The external oblique is the outermost muscle at each side of the waist. The rectus abdominis is one long, flat, continuous muscle that runs from the lower ribs to the groin. While it’s not possible to isolate the upper or lower abs, the two sections may respond differently to flexion exercises that require the shoulders to move toward the hips, than to those that require the hips to move toward the shoulders. Crunches come in two basic types: The basic crunch curls the shoulders toward the hips, and the reverse crunch curls the hips toward the chest. Each works both functions of the rectus abdominis — compression of the abdomen, and flexion of the trunk. Bodybuilders commonly get poor results from crunches for two main reasons: many perform excessive reps with little or no added resistance, and most use incorrect technique regardless of their rep count. With correct technique, moderate reps, and progressive resistance, muscle development will happen. To see your six-pack, you need to be lean. Even minimally developed abs show on a lean person. But to have great abs you need to have better-than-average developed rectus abdominis, and little body fat. You can’t reduce the fat around your waist by doing ab work. Fat reduction from over your abs comes about by reducing your overall body fat, which is primarily a result of dietary control. You could do three hours of ab work daily, but if your food intake and activity level don’t combine to yield an overall energy deficit, you’ll never reduce the fat around your waist. On the other hand, you could do no ab work whatsoever, but if you’re in sustained caloric deficit you’ll draw on your stores of fat and thus reduce your level of body fat. Whether you do ab work is irrelevant in determining the amount of fat around your waist. But to build strong, well-developed abs, ab work is essential. I do lots of hanging leg raises for my abs. While I feel something in my abs, I seem to feel most of the stress in my thighs and hips. And sometimes the leg raises irritate my lower back. What’s up? The hanging leg raise, with straight or bent knees, is a common exercise among bodybuilders, but for ab work it’s not a good movement. It mostly works the hip flexors. The hip flexors include the iliacus, psoas major, and psoas minor, which fuse into a single tendon on the thighbone. These muscles originate on the pelvis or on some of the lower vertebrae, and are hidden from view. They flex the thighbone — lift it towards the torso. And that’s why you feel some of the effect of the hanging leg raise in your hips. And there’s another major hip flexor — the rectus femoris, of the quadriceps. That’s why you also feel the hanging leg raise in your thighs. Substantial hip flexor involvement can produce lower-back problems for many trainees — typically those whose lower backs aren’t strong enough, and who lack sufficient flexibility. Generally, the greater the hip flexor involvement in abdominal work, the greater the possibility of lower-back irritation. That’s why the hanging leg raise irritates your back. The hanging leg raise can be performed in a way that directs more of the work on the abs. But it’s difficult to do, and few bodybuilders have the strength to do it properly. Instead, do a reverse crunch on a horizontal bench. Why are the hamstrings called “hamstrings”? The hamstring group of muscles, on the rear thigh, is so named because the tendons of those muscles are used by butchers as “strings” to attach curing hams to meat hooks (or at least they used to be). 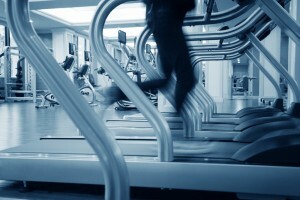 What do you think is the best piece of cardio equipment? The one that’s safe and enjoyable for you, so that you use it over the long-term. Many bodybuilders like to run on a treadmill. This can be safe and enjoyable provided the treadmill has a yielding deck to reduce impact forces on your body, and provided that you’re suited to running. If you have foot or knee problems, for example, or if you’re heavy, running would be a bad choice of cardio exercise. And even if you enjoy running on a good treadmill, if you fall off it you could have a serious accident. Never run to exhaustion. An elliptical is safer, because the impact forces are almost eliminated, and the chance of falling off the equipment is small. Some trainees like rowers, while others find that their knees are irritated when rowing. Some trainees like stairclimbers, while other find that their knees are irritated by that piece of equipment. Some trainees like to use a stationary cycle, but others dislike it. I suggest you choose two pieces of equipment that are safe for you, and that you enjoy using. For example, run once a week on a good treadmill, and use an elliptical at another workout. Find what works best for you.